I thought about putting on socks! BANG – it’s autumn. It is like someone has just flipped a switch. I woke at my usual time, although admittedly for the last week or so I have been sleeping a little longer, and was shocked to find it dark and cold. These do nothing whatsoever to create the illusion summer is still with us. This isn’t how it is supposed to be. We are supposed to be easing ourselves into the cooler weather, not confronted with it suddenly like changing a channel half way through a show on the telly. I’m not sure I like where this is going. Maybe it is a blip – an anomaly and things will return to the warm hazy days soon. But I don’t have high hopes. A sorry sight. 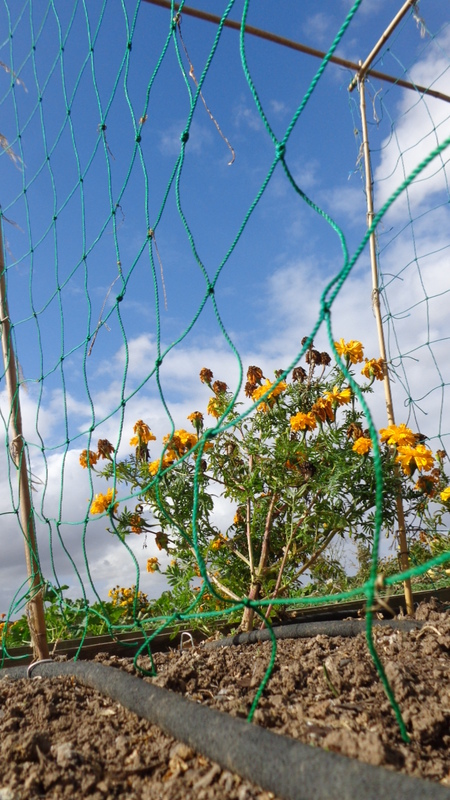 Marigolds forlornly protecting a crop that once was. So I took out my frustrations on anything in the garden that was remotely brown and crusty. 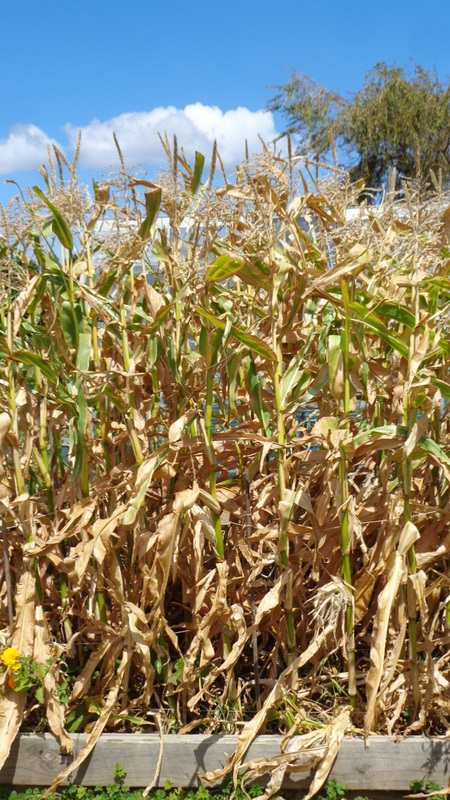 The only real reason there were brown and crusty plants in my garden was I was in complete denial that summer was coming to an end. So instead of pulling out the corn stalks when I removed the ears, I left them there. They were still green and such a huge structure in the landscape of my garden. Autumn tends to rob the garden of any height. They were no longer lush and green, but wispy and brown as they began to shrivel up, as they tend to do at the end of the season. They had finished and all their presence was doing was reminding me in a ‘stick your tongue out and go nah nah nee nah nah’ kind of way that the glory days were behind us. 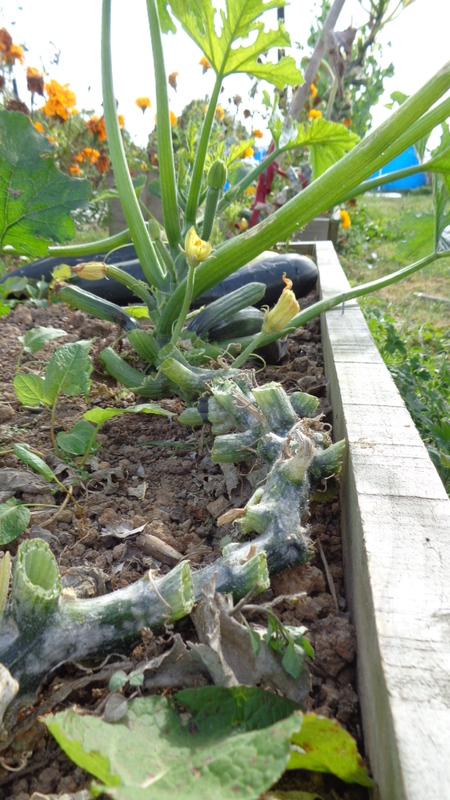 Once the home to more cucumbers than we knew what to do with – so much life… just gone. But they weren’t the only ones to be swept away in this cathartic cleansing of my garden. Beanless beans were removed, leaving behind a barren, seemingly lifeless soil. 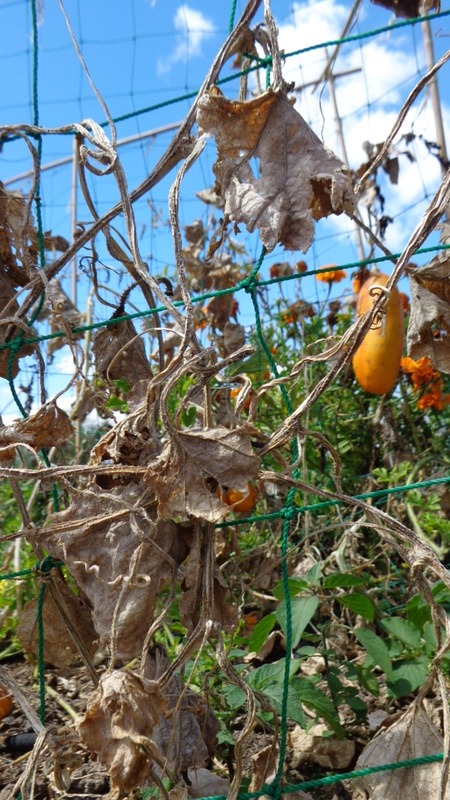 The trellised cucumbers, gherkins and melons that had long since succumbed to powdery mildew were untangled from the netting. They were so far gone that a gentle scrunch released their tight grip on the netting. I even discovered it was much easier to remove the stubborn tendrils while the netting is still hanging there, not trying to pull it all off after when I have pulled out the plants by the net as I normally do. I have gotten myself all in knots before. The lazy way never is! The zucchini didn’t escape my attentions. I noticed they had seemed to have grown out of the powdery mildew and were having a new lease on life and there were fresh healthy leaves without the tell-tale white powdery markings. So I whipped off any leaf that looked even remotely infected and threw them away. Then the sky grew dark and it began to rain, so I stopped. But as soon as I finished clearing up, so had the rain. It wasn’t even decent rain and there wasn’t enough to form a puddle, even if I had channelled it all into one place. This is just another weather taunt as we have only had 13mm of rain in the last 30 days and they say that the autumn is likely to be a dry one. I don’t know whether to be pleased or not. 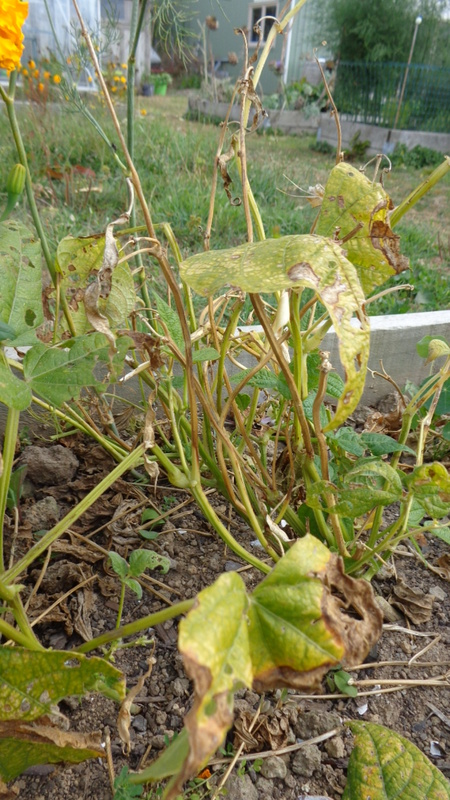 Cold and wet equals miserable, but dry means what plants remain in my garden will be a little stressed. There is a vibrant new life growing out of the lupin cover crop. As I stood back and surveyed the garden, a little of the disappointment had slipped away. The garden looked somehow fresher. I had rejuvenated it by removing the dead, dying and decayed. The greens stood out brighter and I was able to notice the peas are coming along nicely and have long thin pods. The cover crops of mustard and lupin that I sowed to replace the onions and the potatoes have grown remarkably quickly and are providing a healthy vibrancy to the fading landscape. All is not lost – the garden is still mostly green. Come again soon – I think I shall pickle peppers. ← The penny just dropped – I need to garden like a cook! Hi Linda. Hopefully your frosty weather will give way to a wonderfully perfect spring. Oh, if that switch has been flipped, maybe we could get spring here! Congratulations on yet another great garden season. Hi there. Thank you so much for your kind words. I hope you have a fabulous season ahead of you. the end of a season and the start of another…… good to clear away and start afresh, but sad to see it go. Hi Claire. 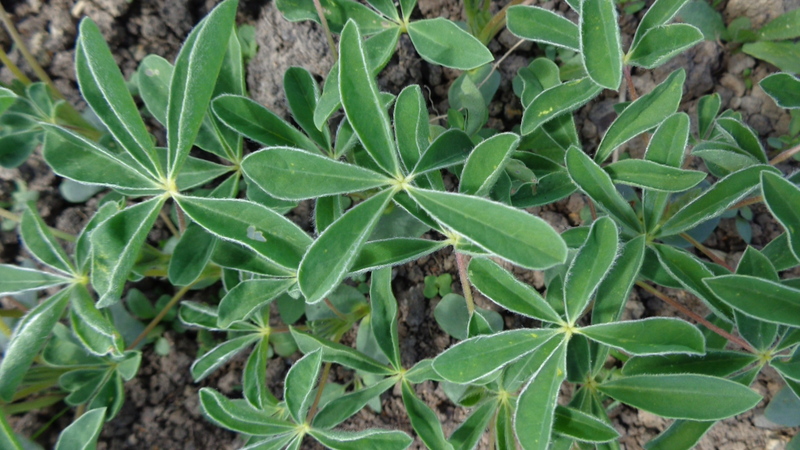 Apparently Lupin has a similar effect to mulch on soil; is good for soil structure, fertility and micro-organism activity. When it is dug into the soil it helps to prepare the ground for the season ahead. It works even better if it is grown with mustard with lupin 3:1. The clean-up season is always a mixed bag of emotions for us, isn’t it? Hi there. I so agree with you. I am quite please to put behind me an average season, however I am still reluctant to let the summer go. I wish our spring would appear as suddenly! Hi Christine. I don’t mind spring and summer appearing suddenly, but not so keen on a quick start to autumn and winter. I hope it comes soon for you. Ah yes, all the same here! Hi Wendy – I hope that storm didn’t wreck havoc in your neck of the woods. Stay safe. Hi Virginia. I really do hope we have a nice winter. The northern hemisphere one just looked absolutely dreadful. I hope spring comes to warm you soon. Thank you, it will be above freezing for a day or so this weekend so it’s a start. Well you’ve had a hard day’s work, haven’t you? So sorry to hear that summer seems to have slammed a door. Weather weirdness continues around the globe, making it hard to know what’s next. I’m glad you got out some of your disappointment by tearing out the dead and dying. You must have an impressive compost pile going all year long. HI Alys. 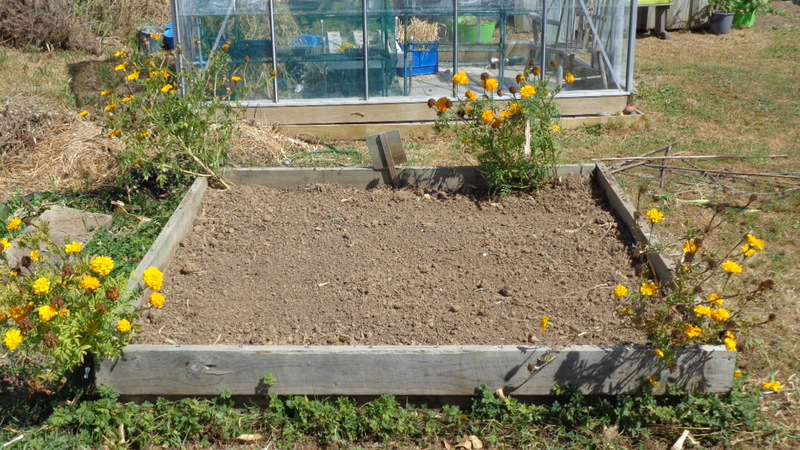 My compost heap at the moment is just a great big pile, but I have dreams for a proper wooden, three bay one that I can rotate rotting vegetation across the years. I am such a classy chick! LOL! My compost is a series of Rubbermade bins and an old trug set aside as a worm bin. It works though. Sorry to hear about the onset of fall in your area. Spring is coming up soon here and I will still be unable to plant my main crops outside until mid-May! I love the way you tell it like it is, you are indeed a truthful gardener. I can so relate to this post.